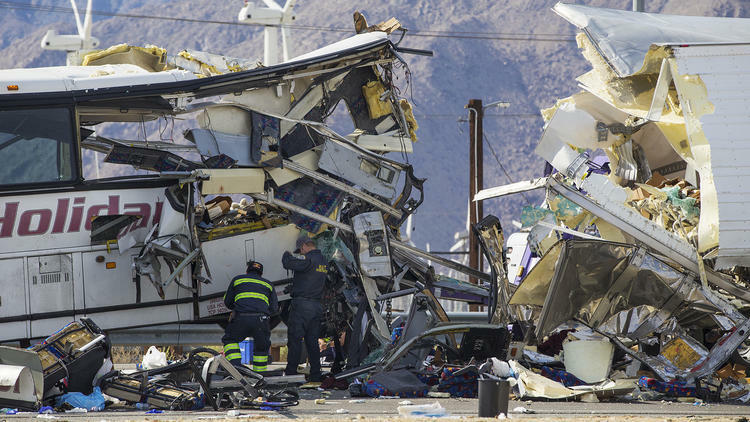 Did Edison Workers Cause The Deadly 10 Freeway Bus Accident? Of course the "Drive By Media" does not report that So Cal Edison & CHP might be partly to blame for the deadly bus accident. It was dark when the crash happened at 5:15 am. The semi was going only about 5 mph in the second-from-right westbound lane; traffic had slowed because of a traffic break a mile or two ahead to allow Southern California Edison workers to pull wires across the 10 freeway. "An Edison maintenance crew had slowed down traffic on Interstate 10 before the vehicles crashed just north of the desert resort town of Palm Springs, California Highway Patrol Border Division Chief Jim Abele said. The work had gone on for hours without problems, he said. CHP officers had been slowing traffic to allow Southern California Edison workers to string wires across the freeway, Abele said." As you can see the accident occurred near a curve on the 10 freeway. Cars and trucks are often moving at 75-90+ MPH on this section of freeway. Did the California Highway Patrol give proper warning to drivers westbound? Did So Cal Edison properly warn drivers that they were stopping traffic miles ahead? Were there warning signs placed on the freeway miles back to warn of the potential slow down? I am curious if Waze was warning drivers at the time of the slow down on their app at 5am? Seems to me that this could have been prevented and not a lot is being reported on the topic.